August 2 , 2009. Until we get a photo of Dubhe this will have to do. Here is the story. 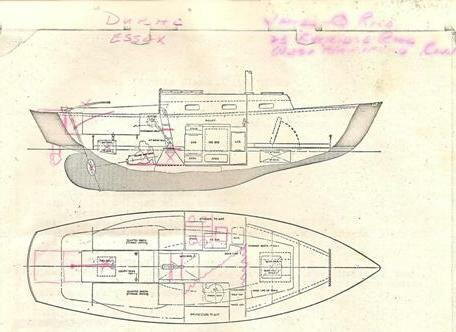 On July 26, 2009 we found a reference to Dubhe in Peggy Benkard's "Black Book", a 3 ring binder that came with the boat Sloop du Jour she bought in 1977. In the book is a copy of a September 1960 George D. O'Day Associates ad that appeared on page 79 - probably from a sailing magazine that we have not been able to identify. The above image is excerpted from that ad. Looking carefully you will see a red penciled note "Dubhe, Essex xxxx Rice, West Hartford, CT", and red penciled sketches superimposed showing an outboard in a transom well and a number of other changes - the tiller head location was moved from the top of the transom deck, the inboard crossed out, a change in the companionway steps, and a change in the galley layout. These were reminiscent of Marionette's set up but at the time no connection was made. We were heavily committed to the theory that 'Dubhe' must have been in the Sloop du Jour lineage. After a short Google search your webmaster was on the phone with Mrs Rice (Jim has passed away) and she told me a bit about Dubhe - pronounced Duby. Mrs Rice had told me that 'Duby' had a white hull and had an inboard! This further hardened the theory that Dubhe was in the Sloop du Jour lineage. 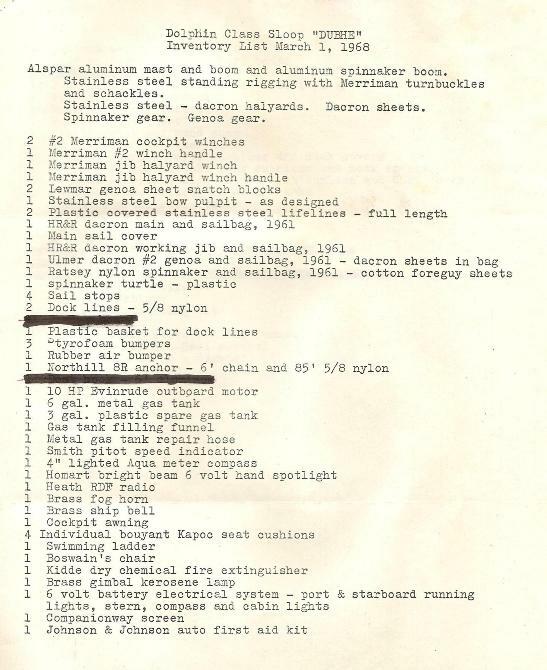 However, Dolphin Field Investigator (DFI) Mark Steinhilber (Rascal) actually read the inventory list when we posted it a couple of days ago, and pointed out by an email to your webmaster that the inventory list had a 10hp Evinrude outboard!? Mrs Rice had further advised that Dubhe was bought from a young couple in Westport, CT in 1966 or so (another missed clue - Phil Zerega, who lived in Westport, was the guy who bought a bare hull from Marscot/O'Day in 1960 and built a wood boat on it, and named it Teal, which later became Marionette) Her husband Jim loved this boat and raced her in Off Soundings Club regattas. Two or three years later they moved on to a Tartan 27 and Jim sailed Dubne down Long Island Sound to Cos Cob where he sold her to a friend. Your webmaster talked to Sam Jones, who owned Julep (now Sloop du Jour) and obtained a bit more information about his boat. When asked about who he bought the boat from, initially, he could not recall, but he did recall that when he bought the boat she was at the Dutch Wharf Boat Yard, in Branford, CT. I told him that in Peggy's Black Book there was a certain pencilled notation - mentioned above. When Sam heard the name 'Duby' it rang a bell then he also vaguely remembered the name Rice. We originally thought we were are getting pretty close - that it was beginning to look like Dubhe (DUBY) became Julep and then became Sloop du Jour. But somehow we have to get Dubhe to Branford - she is now in Cos Cob. After receiving Mark Steinhilber's email another call to Mrs Rice was needed. She told that Dubhe really was Jim's boat and she did not recall many details, but their good friend, Tom Marston, the former owner of Marionette, knew more about the boat than anyone!! Still, no connection was made in your webmaster overworked, over stressed with Dolphin minutia, brain. Of course, I know Tom, Marionette was his boat. So, with very little time off to eat, sleep, and close up the boat because it might rain - again, I called Tom last night. Tom told me that Phil Zerega sold Teal to Jim Rice in/about 1966. Tom and Jim both belonged to the Essex YC, and Tom knew Jim and the boat. 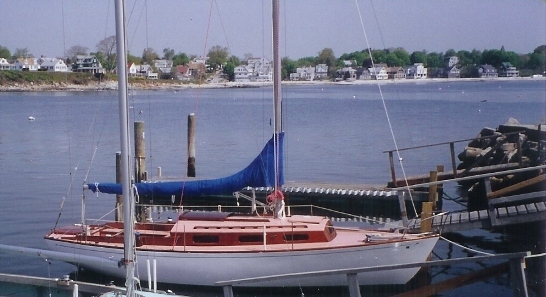 A couple of years after he bought the boat Jim decided to move up to a Tartan 27 and sold her to a couple of friends, one of whom was named Watt, and who lived in Cos Cob. The friends did not get along and, a year or 2 later, they decided to sell the boat. Tom, who had a South Coast 23 at the time, and raced with the guys at Sachem's Head YC - where there were 5 or 6 Dolphins. He told me he got tired of always finishing 2nd to one or the other of those Dolphins and decided to buy Dubhe. He went down to Cos Cob in 1970(?) and sailed her home. He changed her name to Marionette. Tom was a carpenter at Essex Boat Works and his skills were a perfect match for Marionette's hy-bred construction. He raced her successfully for about 12 years, winning the Off Soundings Club Charles Koch Trophy in 1980. He sold her to a friend who sailed her only one year before 'retiring her to a small marina in Old Saybrook, CT - where she sat for at least 10 years. Eventually, she was donated to the Connecticut River Museum in Essex where your webmaster found her. Click here to go to her continuing story. 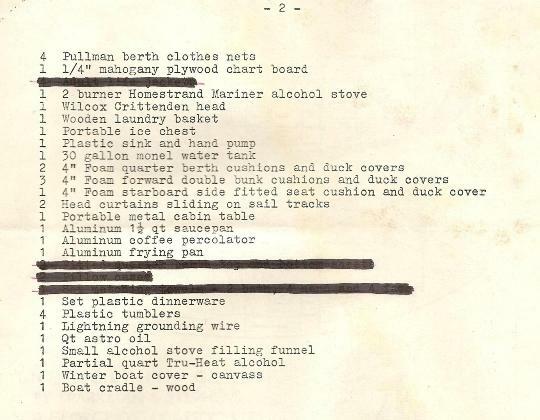 Below is a copy of the March 1, 1968 inventory list that was found in Peggy's black book. We thought that this was what Sam Evans would have received when he bought this boat - if he did buy this boat. He didn't.